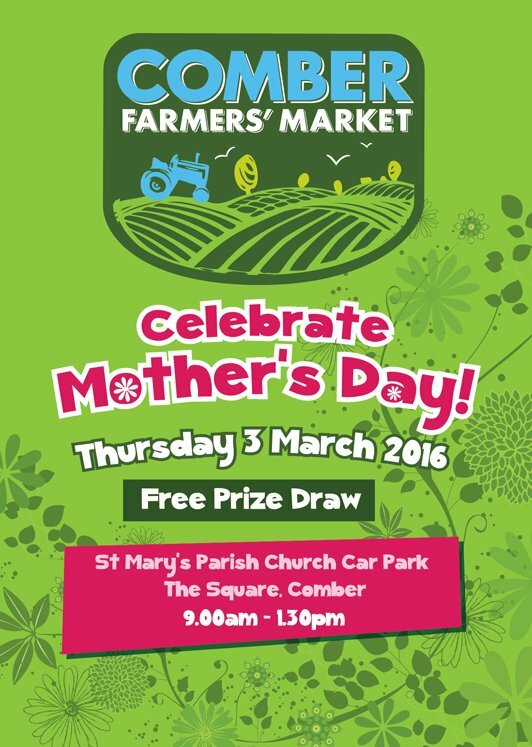 Comber Farmers’ Market is getting ready to pamper Mums at the monthly market on Thursday 3 March 2016, St Mary’s Parish Church, Comber, 9.00am – 1.30pm. So come along and support your local market and your local food producers. We love to see you there! 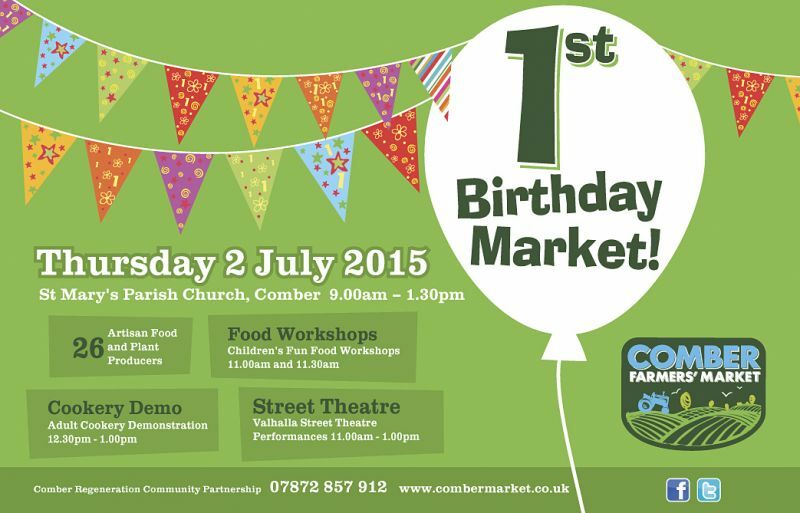 Comber Farmers’ Market would like to wish all our traders and customers a Happy New Year! We took a break in January and are now gearing up for our next market on Thursday 4 February 2016. With the exception of our flower and plant stalls, all our regular traders plus a few new faces will be attending so we hope to see you there. As this year has been designated the Northern Ireland Year of Good Food, we are planning a few spectacular markets in the months to come so keep in touch with our Facebook and Twitter pages and our website to find out what is happening. 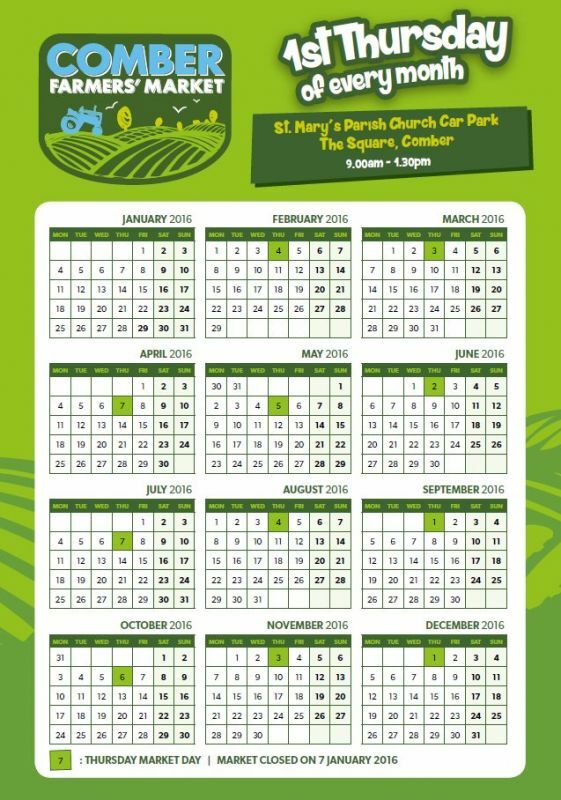 It’s all happening at the Christmas Comber Farmers’ Market on Thursday 3 December, St Mary’s Parish Church, 9.00am – 1.30pm! There will be 30 artisan food stalls selling top quality food which has been grown, reared, made or baked by local food producers. With Christmas just around the corner, you can buy mince pies, Christmas puddings, cranberry sauce, mulled wine spice mix and lots of other seasonal produce. Christmas trees will also be on sale or you can order one and get it delivered to your door. New traders include Miss McKeown’s Teas, the Belfast Coffee Co, Halberno Steve, the Krazi Baker who bakes soda and wheaten farls on his griddle at his stall, and Lisbarnett Turkeys will be taking orders for their traditional farm reared turkeys. There are plenty of lovely food products to buy for Christmas presents or for stocking fillers. Don’t miss this opportunity to stock up with seasonal goodies for the festive period. 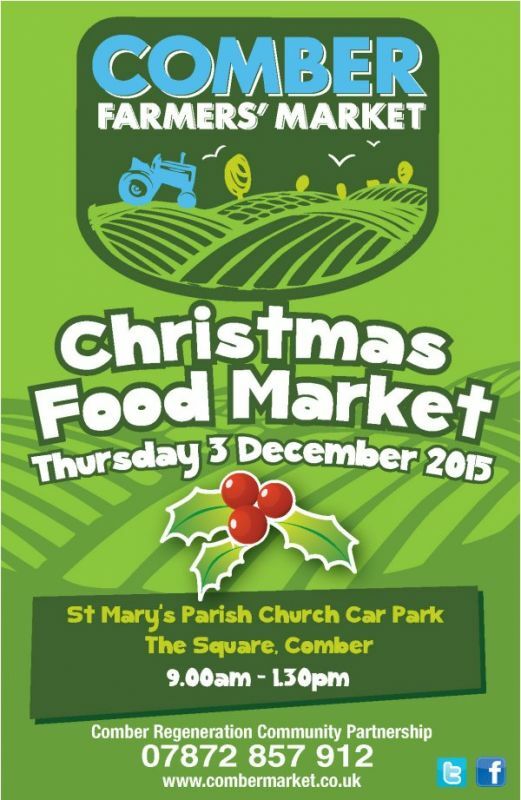 Comber Farmers’ Market has announced its Christmas programme which is sure to appeal to young and old! The popular morning teas, coffees and traybakes will be served in the church hall where market goers will be entertained by the choirs from Andrews Memorial PS and St Mary’s PS. 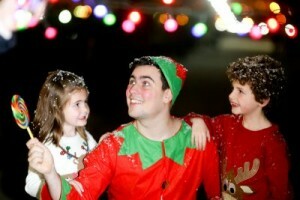 Tiny tots will enjoy meeting Bubbles the Elf and there will be a free raffle for food hampers from the market. We have a gazebo grotto, face painting and a demonstration on how to make beautiful flower arrangements for the Christmas table. 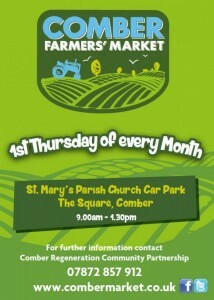 So come on over to Comber Market where a warm welcome awaits you! 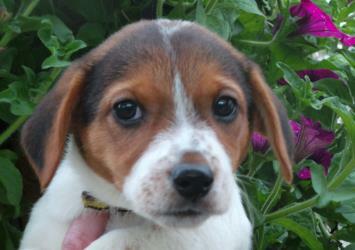 Jennifer, a Jack Russell Terrier puppy, who needs a kind family to look after her. 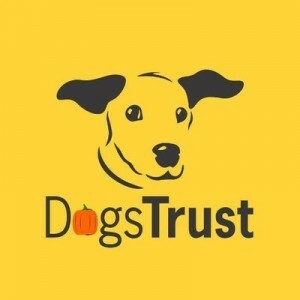 The Dogs Trust charity, which is based in Ballymena, will be coming to the next Comber Farmers’ Market on Thursday 5 November. They will be promoting responsible dog ownership, giving advice on how to be safe around dogs as well as showing off all the lovely dogs they have for rehoming. They will also be handing out neutering and microchipping vouchers plus free health check vouchers to members of the public who need them for their dogs. The ladies from St Mary’s Parish Church, Comber, who serve teas, coffee and home baked scones and cakes to the customers of Comber Farmers’ Market in the church hall will be donating the money raised to McMillan Cancer Support at the next market on Thursday 1 October 2015. Rosemary Cooper who is on the church catering committee said, “Since the market opened last year we have had a team of volunteers who bake cakes and serve morning teas in the church hall on market day. It has become a social event and meeting place for the residents of Comber who regularly turn up for a good old chat and a nice cup of tea and a bun. We don’t charge a specific price for the teas but ask people for a donation which go towards for church funds. We would like to thank all our valued customers for their generosity and support and hope that they will turn up on the 1st October to support our McMillan coffee morning and help us raise much needed funds for this worthy charity. 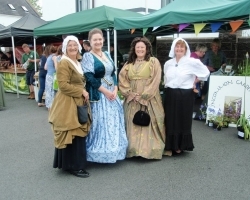 Spice Up your Life at Comber Market! 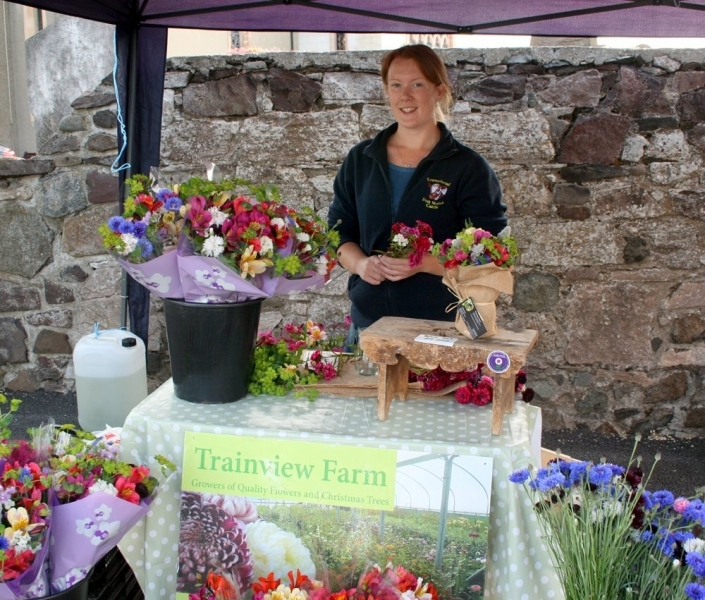 New trader Currysauceni has joined Comber Farmers’ Market. 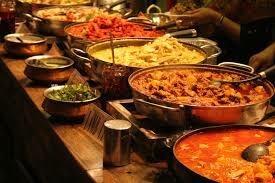 Husband and wife team George and Lilian Kennedy set up their business in 2006 selling ready to use curry sauces. Just add meat, chicken, pork, fish or vegetables to create authentic dishes from India, Malaysia, Thailand, and Morocco in minutes. Their range includes Korma, Rogan Josh, Thai Green, Rendang, Tikka Massala, Balti, Jalfrezi, Madras, Thai Red and Makhani (sauce for butter chicken). The sauces are gluten free (except rendang), nut free, and contain no msg or artificial preservatives. 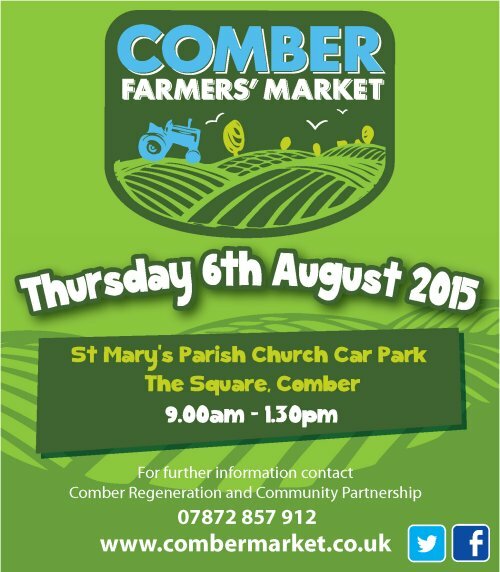 The next Comber Farmers’ Market takes place on Thursday 6 August 2015, St Mary’s Parish Church car park, the Square, Comber, 9.00am – 1.30pm. We are delighted to welcome newcomer Farmhouse Treats from Moneyreagh who make home baked cakes, tray bakes, tarts and meringues. Come along and try these tasty treats! 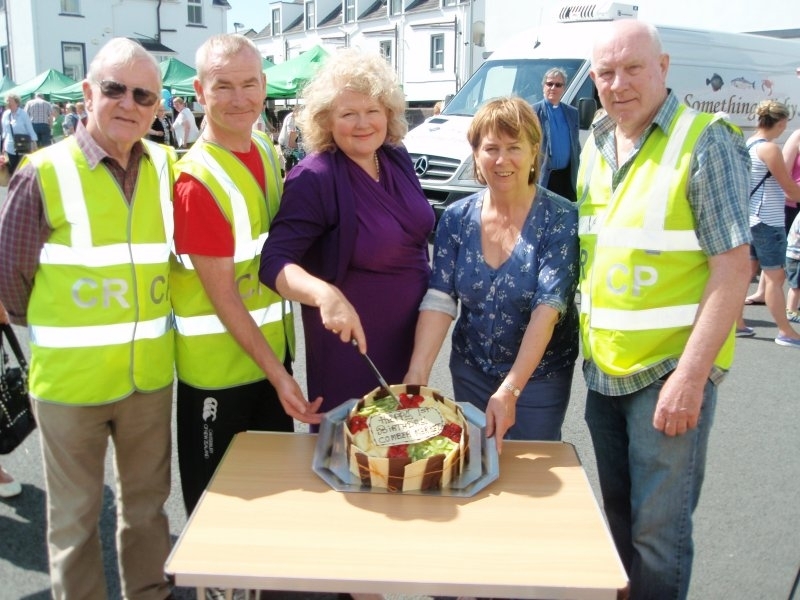 A big thank you to everybody who attended our 1st birthday market on 2 July which was a huge success made possible by a Community Festival grant from Ards and North Down Borough Council. 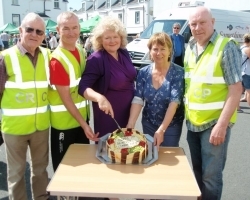 We were delighted to welcome Michele Shirlow of Good Food NI who came along to cut the birthday cake and help us celebrate this significant milestone. 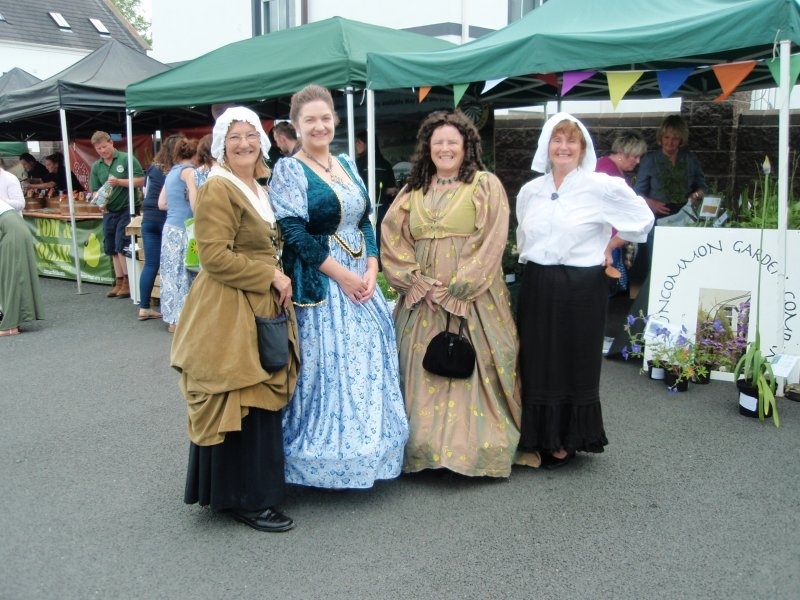 We were also joined by Valhalla Theatre Company who came dressed as Ulster Scots circa 1640; Chris Irwin from Belfast Metropolitan College who ran good food workshops for children; and the Tammy Conn School of Dance who performed a flash mob dance in the middle of the car park. In addition, Valhalla Street Theatre Company will perform sketches between 11.00am – 1.00pm. Bunting and balloons will decorate the stalls and there will be lots of surprise freebies for children. 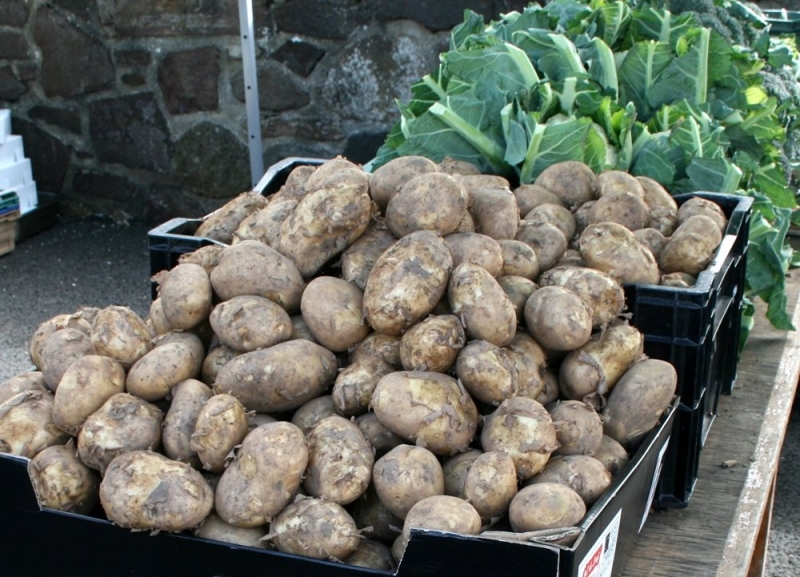 Plus Comber Earlies potatoes are in full season! Come along and get your spuds and join in the fun.